We were bored on Saturday and saw piñata cookies on Pinterest. They were so cute, and look so simple, but we wanted to see if we needed to call shenanigans! Pinterest Version Our completed cookies! Not bad, eh? 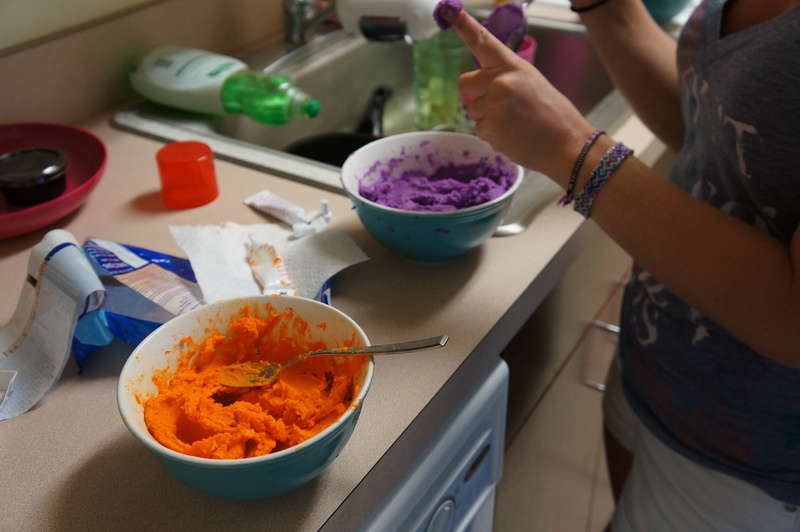 Step 1: Dye the dough! 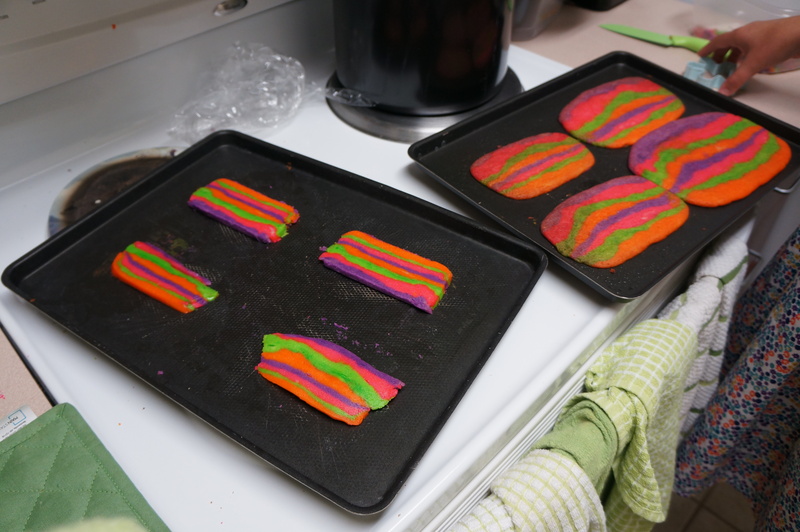 We used neon food dye, because we thought that it would be more fun! Warning: Your fingers may turn colors (Amelia was pink for a few days). We had to buy 3 packages of pre-made cookie dough to complete the project, and we honestly could have used a couple more; the directions neglected to tell us that we would need that much. 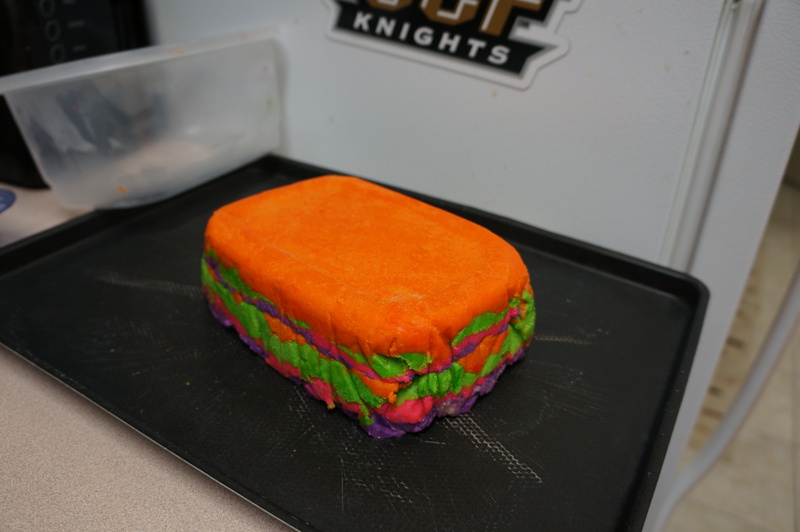 We used neon food dye, because we thought that it would be more fun! Step 2: Layer the Dough! Find a loaf shaped container (we used a Glad container that we had). Line the container with wax paper or saran wrap (we used wax paper, because that’s all we had). Put the dough loaf in the freezer for about an hour. Step 3: Slice the Dough Loaf! Cut loaf in slices that are about half a centimeter thick (they don’t have to be perfect, because ours sure weren’t). They expand a lot when baking so if you think your cookie cutter won’t fit, don’t worry! Step 4: Cookie Cutting Time! It told us to use a “burro” cookie cutter, but shockingly we couldn’t find one, so we just used a snowflake one that we already owned. So get creative with your Piñata, remember that they come in all shapes and sizes! Cut them as soon as they get out of the oven so that they don’t crack. You will get better progressively, but make sure you keep your messed up ones, because they might come in handy. Make sure that the cookie cutter goes all the way through. Put a full cookie on the bottom and then use cookie scraps and icing to make form a little bowl in the middle. 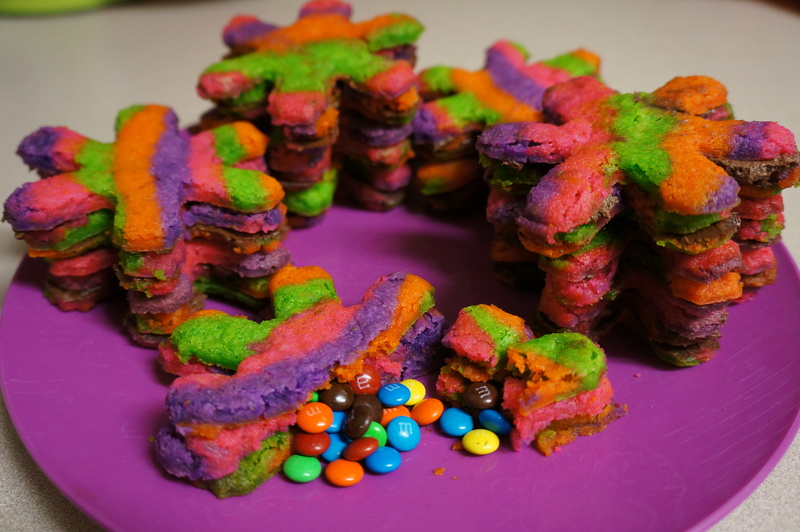 Then put another full cookie on top, and Ta Da!- Piñata Cookie! They didn’t hold as many m&m’s as we would’ve liked, but they were still adorable! So there you have it! It is do-able, but remember that it is very time consuming, and they only taste as good as whatever cookie dough that you use. So just know that they are not the most amazing tasting cookies, but they are super fun to look at! YAY ! so glad I found your site ! I think maybe the problem was the store bought cookie dough! Try using a recipe for rolled cookie dough! The store bought isn’t meant for shapes. It spreads too much. Search on google ‘best rolled sugar cookies’ and use that one. Bet it would help a ton. Maybe round two?